Dr. Travis Malone is Dean of the Susan S. Goode School of Arts and Humanities at Virginia Wesleyan University. 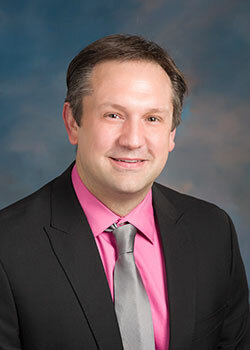 He received his Ph.D in Theatre from Bowling Green State University, his master’s degree from Kansas State University and his bachelor’s degree from Sterling College. His previous roles at Virginia Wesleyan have included Humanities Division Chair and Coordinator of the Theatre Department. In addition, he teaches courses in Directing, Technical Theatre, Acting, Theatre of Diversity, Acting for the Camera, Theatre History, and study away courses in Theatre. As a theatre and film professional, Dr. Malone has directed and acted in productions across the country. He worked in Los Angeles writing television commercials for Disney, Fox, and Rhino Records; producing music videos for Disney; and developing creative content for DVDs and trade show promotions. A proud member of the Stage Directors and Choreographer’s Society, he continues to act and direct in the Hampton Roads area. His main research areas include the intersection between film and theatre, musicals on stage and screen, and assessment in undergraduate theatre programs. Dr. Malone lives in Virginia Beach with his wife, Becky, and their three children.